A district attorney called Genene Jones “pure evil”. 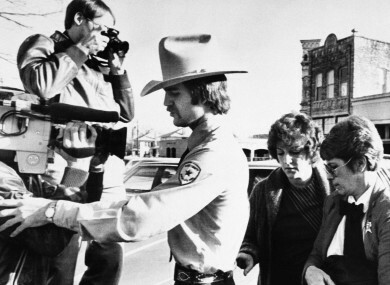 Genene Jones, second right, is escorted into Williamson County Courthouse in Georgetown, Texas in 1984. A TEXAS NURSE jailed for killing a baby more than 30 years ago has been charged with the murder of another infant, and could be behind the deaths of as many as 60 babies, officials said today. Genene Jones, 66, “is pure evil and justice warrants that she be held accountable for the crimes she committed,” said Nico LaHood, district attorney for Bexar County in Texas. “Our office will attempt to account for every child whose life was stolen by the actions of Jones. Our only focus is justice,” said LaHood. Jones is currently serving two sentences for crimes committed in 1984. She was sentenced to 99 years for killing 15-month-old Chelsea McClellan with a lethal dose of a muscle relaxant, and for administering a potentially fatal dose of an anti-coagulant drug to a four-week-old boy, Roland Santos, who survived. Jones, a nurse in a pediatric intensive care unit, was also accused by a grand jury of killing 11-month-old Joshua Sawyer by injecting a lethal dose of an anti-epileptic drug three years earlier, in 1981. “Jones is suspected of killing up to 60 infants,” said a statement issued by the district attorney’s office, based in San Antonio. Jones is serving her concurrent sentences in a prison in the town of Gatesville, Texas, located between San Antonio and Dallas. Due to a law in place at the time of her trial, she is due to be released in March 2018. The Bexar attorney’s office said her bail would be set at $1 million and that she would be transferred to a jail in Bexar County for trial on the new charges prior to her mandatory release next year. If convicted, she faces up to 99 years behind bars. Email “US authorities believe nurse could have killed as many as 60 babies”. Feedback on “US authorities believe nurse could have killed as many as 60 babies”.